Two European spacecraft are currently enjoying their final moments high above the planet, as they continue their descent towards a fiery re-entry. ATV-4 – which recently undocked from the International Space Station (ISS) – is set to re-enter on Saturday, while the GOCE spacecraft has already begun its slow drop towards its ultimate fate. ESA’s Gravity field and steady-state Ocean Circulation Explorer – GOCE – sealed its own fate, following the depletion of its fuel supplies after a four and a half year mission in space. Launched on March 16, 2009 via a Russian Rockot – a converted SS-19 Russian Intercontinental Ballistic Missile (ICBM) – GOCE has mapped variations in Earth’s gravity in detail during its mission. It also provided the data to create the first global high-resolution map of the boundary between Earth’s crust and mantle – called the Moho – and detected sound waves from the massive earthquake that hit Japan on 11 March 2011, among other results, prior to the spacecraft’s xenon tank running out of gas. No exact time of entry is known at this time, with many factors in play. According to ESA, GOCE was last reported to be at an altitude of roughly 205 km, having lost about 19 km since depletion of fuel on 21 October. The atmospheric drag has increased substantially during the orbital decay, from an average of about 8 mN (milli Newton) to above 15 mN. Per the parameters of how soon GOCE will end its mission via a destructive re-entry, the recent rise in solar activity has contributed to a noticeable increase in drag on the spacecraft, in turn accelerating its descent. ESA also note several coronal mass ejections (CMEs) are expected to reach our planet, which may spark storms in Earth’s geomagnetic field and hence lead to a large increase in the atmospheric drag at GOCE’s altitude. Dubbed the ‘Ferrari of space” – due to its sleek, aerodynamic design – the spacecraft will disintegrate during entry-interface with Earth’s atmosphere. 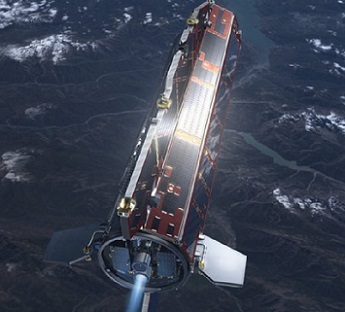 Meanwhile, another ESA spacecraft, the ATV-4 resupply ship, is preparing for its own fiery entry on Saturday. The “Albert Einstein” ably completed a flawless mission with the International Space Station (ISS), undocking on Monday for a five day farewell in formation under the orbital outpost. Under the guidance of the ATV Control Centre in Toulouse, France, ATV-4 has been performing delicate maneuvers over the course its final days, allowing for a re-entry on Saturday that will be observable from the ISS. Two engine firings were performed early on Thursday, decreasing the spacecraft’s speed by 1.7 m/s. 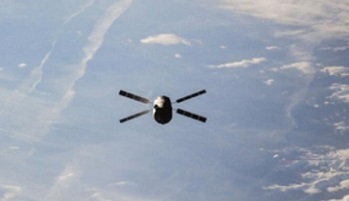 The thrusters were ignited for 29 seconds, bringing ATV-4’s orbit down to around 360km – around 50 km below the ISS. The next set of fine tuning is planned on Friday evening (UTC). Controllers will then begin the re-entry procedure around midday on November 2, when ATV-4 is 120 km below the Station. Should all go to plan, the destructive re-entry will provide additional data, both onboard the spacecraft via its Re Entry Breakup Recorder (REBR) and through the additional live observations from the Station – all of which provide valuable information to calibrate future spacecraft re-entries. While ATV-4 bids farewell, the next – and last – ATV is already deep into preparations for its own launch to the ISS. ATV-5 – named “Georges Lemaître” – was recently shipped from its prime contractor Astrium in Bremen, Germany, to the European Spaceport in French Guiana, ahead of launch integration tasks with its Ariane 5 ES launch vehicle. The duo are set to begin the ride uphill in June of next year. 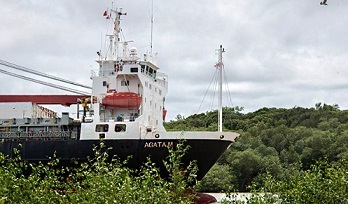 Following its voyage across the Atlantic Ocean to French Guiana’s Pariacabo Port aboard the AGATA M cargo ship, Arianespace will begin final assembly on the Integrated Cargo Carrier (ICC), solar panels and the separation and distancing module (SDM). 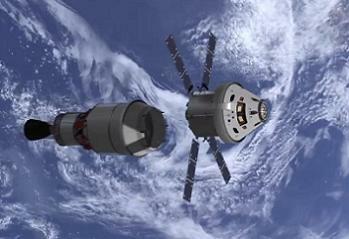 Following ATV-5’s mission, key elements of the spacecraft will change call signs, becoming the bulk of the Service Module for NASA’s new crewed spacecraft, the Orion. Debuting with the Exploration Mission -1 (EM-1) flight in 2017, the use of ATV hardware as part of the Service Module is expected to become a long-term deal between ESA and NASA. Officials on both sides of the Atlantic have noted the arrangement is expected to become permanent throughout NASA’s Orion roadmap, as most recently noted by Mark Kinnersley, Director, MPCV ESM Astrium during last month’s Wernher Von Braun Symposium. Such a long-term deal would be subject to negotiations between ESA and NASA over the coming years.